By now most of us who decorate our homes with trees have them up and covered with ornaments. I thought I’d pass along the history of the Christmas Tree. As with many of our Christian traditions, the tree started out as a pagan tradition. European and Egyptian pagans thought that the Sun was a god to whom the placing of evergreen during the winter solstice was a surefire way to entice the sun god to revive in the spring and cover the earth once more with greenery. Romans used fir trees to decorate their temples during Saturnalia--the winter festival honoring Saturn, the god of agriculture. One early church father, Tertullian, wasn’t a fan. In the 2nd century he wrote his followers to “leave the trees to the heathens, over whom the fires of Hell are imminent”. Tertullian sounded like a barrel of laughs. When did we Christians get on board? That’s a matter of debate. One tradition has it that the town of Tallinn in Estonia erected a tree in the middle of town, danced around it and sang songs and then set the tree on fire to celebrate Christmas. Another legend has it beginning in Germany by way of what they called the “Paradise Tree”--an apple-adorned fir to represent the Tree of Knowledge from the Garden of Eden. What we can say with some certainty is that Christmas trees didn’t make it into personal homes until Martin Luther’s “yuletide vision”. While taking a nighttime stroll through a pine forest near his home in Wittenberg, he noticed the sight of thousands of stars twinkling through the branches of the tree. Luther supposedly raced home, erected a tree in his home and decorated the branches with lighted candles. Soon other Germans were erecting trees in their homes and covering them with apples and gingerbread and various trinkets. The trees arrived in our country via german settlers in Pennsylvania. They didn’t become “fashionable” until 1848 when a photograph of Queen Victoria’s tree at Windsor Castle was printed in Philadelphia’s “Godey’s Lady’s Book”. Incidentally, in that photo featuring the Queen and Prince Albert of Germany (who gave her the tree as a gift), the magazine removed her crown and his moustache as a way to make the scene look more “American”. The East Coast went wild over the image and the Christmas tree became all the rage. It was Thomas Edison’s assistant, Edward Johnson, who dreamed up the idea of the Christmas lights. In 1882, not long after Edison invented the electric light bulb, Johnson hung a string of 80 red, white and blue bulbs on the tree of his New York City home. He invited journalists and photographers to come see. 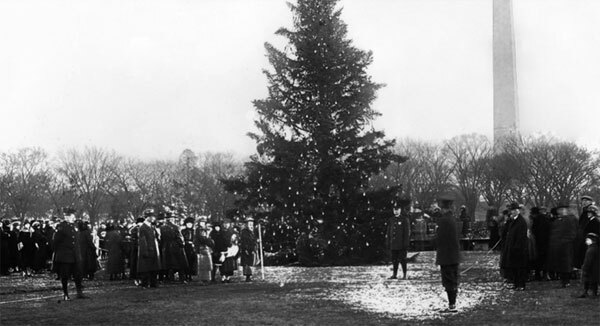 In 1924, Calvin Coolidge lit the first “National Tree”--a 48 foot Balsam Fir covered with 2500 lights. That tree has been lit every year since except during the years of World War II and in 1979 when only the topper was lit in honor of the American hostages in Iran.